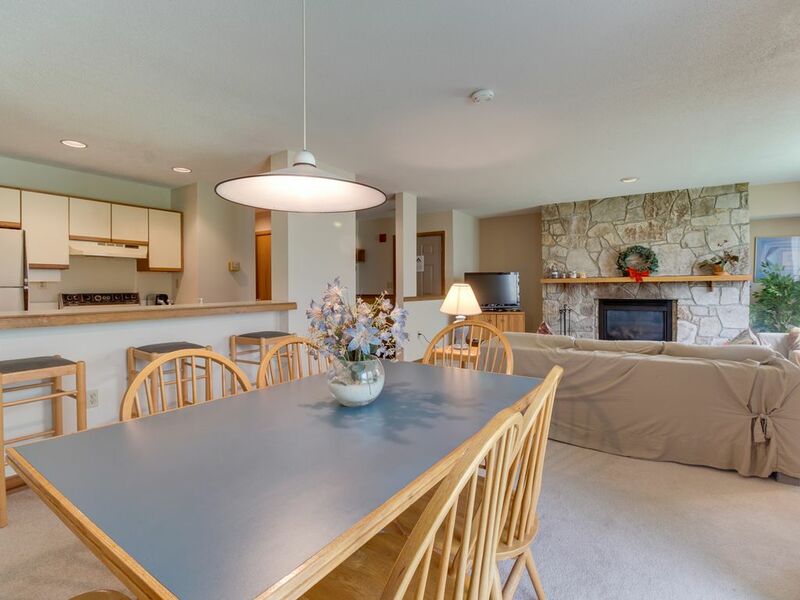 This Vermont condo offers pristine ski slopes within walking distance and a full complement of resort amenities outside, cozy home comforts inside, and a quaint small town just a quick drive away - what more could you ask for in a ski condo? The Seasons is a skier's dream come true, with access to Mount Snow's ski resort. The complex offers a complete recreation package with a shared hot tub, sauna, indoor pool (plus a seasonal outdoor pool), seasonal tennis and basketball courts, and a game room with Ping-Pong and shuffleboard. Summertime visitors needn't worry, as the relaxing shores of Snow Lake are just as close. Whether you're looking for an intimate getaway with that special someone or searching for that perfect family ski vacation, this ski condo is just what you've been looking for. A cozy, carpeted living room offers comfy furnishings, WiFi and cable access, and a fireplace to get you relaxed and toasty after a long day on the slopes. Plenty of natural light means this house is light and bright all year long! After making a bite to eat in the kitchen, which includes a breakfast bar for the kids and a dishwasher that makes clean-up a breeze, you can kick back and relax by the fireplace or take in some mountain air on the private deck. This two-bedroom, two-bathroom condo can house up to six guests. A master bedroom offers its own separate bathroom, TV, and queen bed. Another bedroom offers two beds for the kids. A sleeper sofa is available for additional accommodations. There's plenty to do for guests who want to spend time away from the slopes. Adventurous guests can enjoy hikes on Mount Snow's trails and put themselves to the test with natural activities like snowmobile tours of Mount Snow and the Green Mountain Adventure Challenge, which immerses participants in all the natural beauty the Dover area has to offer. Speaking of Dover, the small town is just a short drive away from the ski condo, and offers plenty to do in the form of restaurants, the Southern Vermont Natural History Museum and small businesses. Whatever you want to do, be it relax by a warm fireplace, tear up mountain slopes, or explore the beauty of Dover and the nature surrounding it, The Seasons provides you and your family with a convenient, relaxing place to stay while you do it. Parking Notes: Parking is limited to two cars. Parking passes are in the unit and should be displayed in your vehicle throughout your stay. Please return all parking passes to the rental upon departure. Thank you. If the parking passes are not left in the unit upon departure, guests will be issued a $50.00 fine. Any units having more than two cars will be issued a fine by the association. There is limited overflow parking at the sports center, but it varies depending on snowfall and occupancy of the association. Seasons is great location with amazing staff at the clubhouse. This particular unit is in need of some updates and improved cleaning and maintenance by the owner or whoever maintains the unit. Vacasa was quick and responsive with people who came to address certain issues we called in and provided new pots/pans and shower curtain, but these are things that should be maintained regularly. Also, there were no clean linens provided for the pull out even though it is advertised as a 6 person unit. Despite this being just before peak ski season, the unit did not seem refreshed from last season and had scuff marks on walls, dust in random places, scraped up pots/pans, a burnt casserole dish, dirty shower curtains and a bath rug stuck to floor. The kitchen appliances were newer and clean and overall the unit was cozy but needed some TLC and maybe a new set of couches. If you are looking for Vermont charm, you will not find it here. This outdated unit is located in a care-worn building with a hallway staircase that creaks. You can hear the guests in the room above pacing about both day and night. The toilets have brown water in them ( prior to use!) and tend to overflow when flushed for any reason ( hence the plunger...when was the last time, if ever, you saw one in rental?). The living room furniture might as well be futons, the sofa and love seat are so low! Both are covered with oversized sheets in a muddy brown color. Ugh! There is no iron or ironing board in the room, so prepare to walk around in wrinkled clothing...forget going out for a nice dinner suitably attired. Remember the fake brass beds of the 70s'? Well, if you're feeling nostalgic, you'll find one here...with a very hard and uncomfortable mattress. Let's face it, Mount Snow needs renovating and this unit in the Seasons is one depressing place. Like I said, if you're looking for charm and comfort, this ain't the place. So very disappointing...and this was my sweetheart's birthday "surprise". sigh. Don't be fooled. For $200 per night ( on Expedia), you can do better. This condo is not rented in the winter, but the owner says improvements are on the drawing board for the spring. We look forward to sharing these changes with you! Booked this property last minute for the wife and myself in spite of the absence of any reviews. Pictures look inviting but the flat is dated and in serious need of an upgrade. Most of the furniture is well-worn, hammer hacked, and a few pieces look as though they came right off a rubbish bin. We were late getting into the flat due to poor communication on the location of the lockbox. Turns out the one on the exterior door was not the right one as there was a second one inside the common area. Discovered that purely by chance mind you. The flat was not prepped for our arrival. The hot water wasn't on, dishes weren't washed, kitchen area was filthy, and we only had enough linens for one person. Hopefully the bed linens were clean because we were too tired and unable to do anything about that. The only reason I'm not disputing a portion of the hire fee is the fact that Vacasa responded quickly to all of my calls about the water and linens. So I have to give them credit for that but there is really no excuse for the issues we had. So I wouldn't rule this property out absolutely if you are considering one in The Mt. Snow area--it is very conveniently situated to the summit--but you might bear these caveats in mind. We want to sincerely apologize that the home was not better prepared for this guest's arrival. We greatly appreciate their patience in the matter.